Once again, Bulgari set a world record, this time with the Octo Finissimo Tourbillon Automatic. Measuring an incredible 3.95mm in thickness, it is the thinnest automatic tourbillon wristwatch in production. Built entirely in-house at Bulgari’s manufacture, it is Bulgari’s fourth world-record-setting watch for thinness. 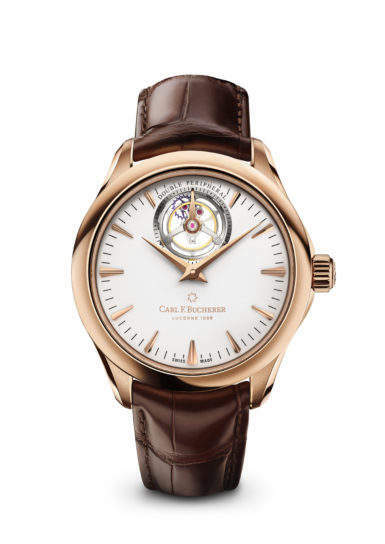 Powered by the new caliber BVL 288 with automatic winding, it has a gold peripheral rotor on the back of the movement. By placing the oscillating weight on the outer portion of the movement, its watchmakers had more room to add the one-minute flying tourbillon. The movement, with 52 hours of power reserve, has also been skeletonized, so in the end, the caliber measures only 1.95mm thick. 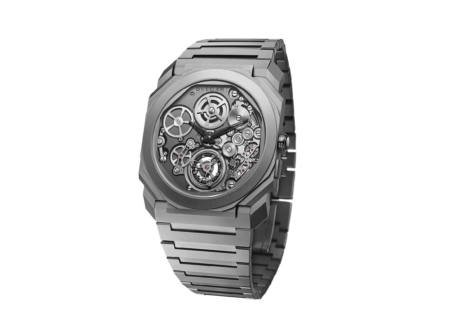 The finished 3.95mm titanium watch still packs a powerful punch thanks to the unique octagonal case shape and sleek design. The solid caseback has a sapphire aperture that recalls the flagship store’s doorway in Rome.